Thinking of buying a new smartphone fitting under the budget? Many smartphones lack many features whatever the price may be. 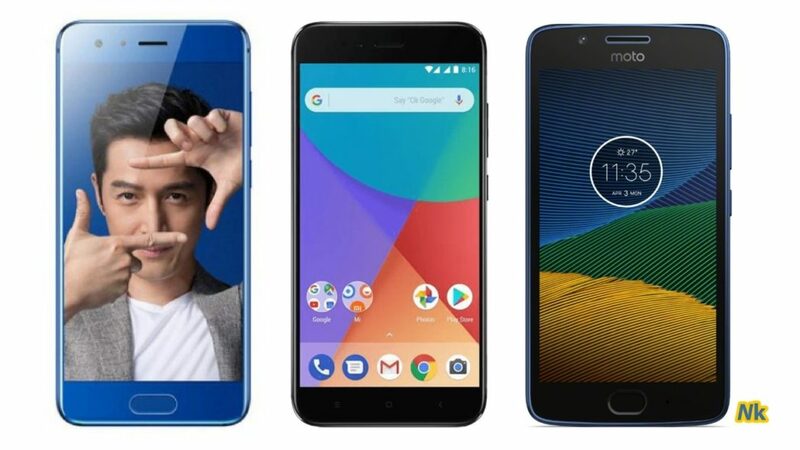 Let’s check which are the best smartphones in India priced under Rs 15000. Read down! 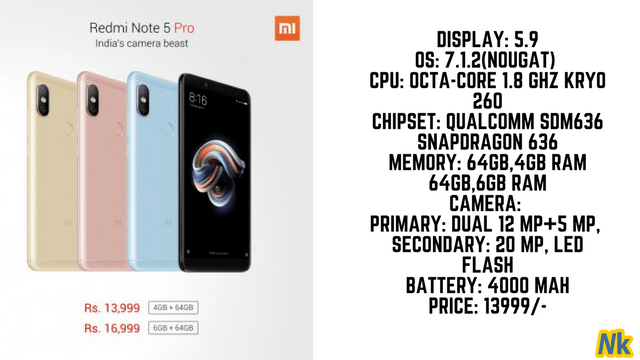 The new Redmi Note 5 Pro is one the best mobiles priced under ₹ 15000. It has a dual camera with 12MP + 5MP with Sony primary sensor. The front-facing camera has 5MP with Sony soft sensor selfie light. With the new Redmi Note 5 Pro, you can unlock your phone with Face Id within 2 sec. The Snapdragon 636 makes it faster compared to the Redmi mobiles. The mobile comes with 18:9 full-screen display which gives great user experience for playing games and watching movies. With the 2.5D Corning Gorilla, the screen feels and looks incredible. The Gorilla glass protection provides extra safety for the mobile. With the 4000mAh battery, the mobile offers 19 days of standby. It does support quick charging making it easy to charge the phone in a much faster way. It has hybrid sim slots; the user can either use two sim cards or use one. The colours available are Lake Blue, Black, Gold, Rose Gold. 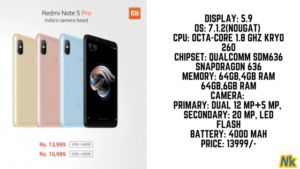 The MiA1 is an Android one device by Xiaomi. It comes with a metal body. MiA1 has a Dual camera with 12MP + 12MP which has a wide angle and telephoto lens. With the dual camera support, the user will get to use 2x optical zoom. The front-facing camera has a 5 MP camera. The device has 13.9cm (5.5)FHd display with 2.5D curved Corning Gorilla glass. The widescreen gives the best output of HD videos and high-resolution games. It comes with Octa-core Snapdragon 625 processor. 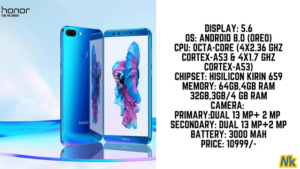 It comes with 4 GB ram with 64 GB internal storage. It has 3080mAh battery with a Type C USB cable. Being an Android one device, it will be getting Android 8.0 Oreo as well as guarantee update of Android p as well. Also Read: Ways to protect your smartphone in Holi! 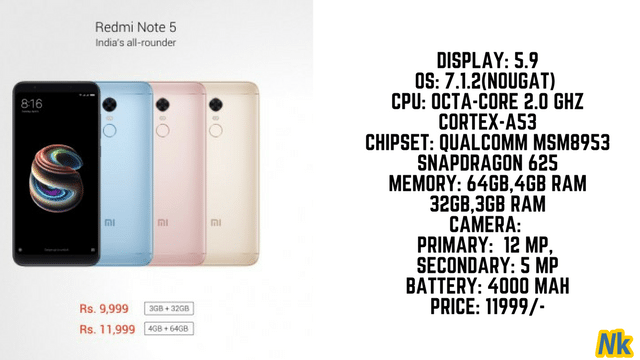 After the success of Redmi Note 4, the Xiaomi has launched the new Note 5. 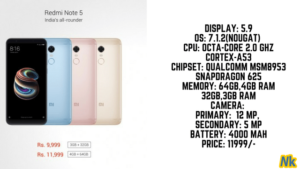 The design is almost similar when compared to note 4 but the specification possesses some difference. It has a 5.99-inch display with 2.5D Corning Gorilla glass protection. With 64 GB variant, the user will get 4 GB of RAM. It comes with Qualcomm Snapdragon 625 for better gaming performance. Note 5 has 12 MP primary camera with f/2.2,1.25µm. And the front-facing camera has 5MP. It has Non-removable 4000mAh battery which provides 17 hours standby. Besides, it does support fast charging. Moto G5s Plus comes with a full 5.5 HD display. It is built in all metal uni-body design. It comes with Qualcomm Snapdragon 625 processor with 4GB of ram.it has internal 64 GB storage and can extend up to 128 GB. It does come with a dual primary camera with 13Mp + depth editor f/2.0 aperture. And the front camera comes with 8MP wide angle lens. The device has a non-removable 3000mAh battery and does support fast charging. Like all the Moto devices it has water repellent Nano coating. The device is currently running on 7.0 Nougat, and the company is promising to deliver it with 8.0 Oreo. 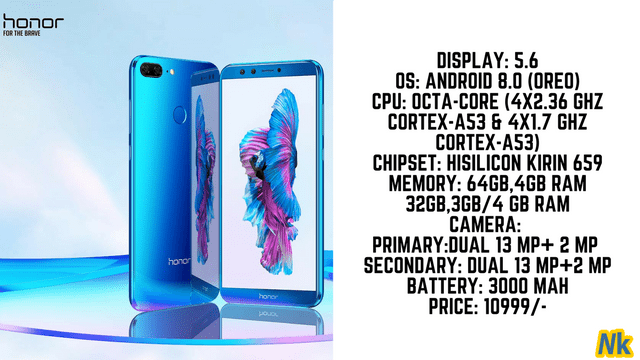 Honor 9 lite comes with a 5.69-inch display with front and back screen. The Device runs the latest android version 8.0 Oreo. It has HI Silicon Kirin 659 chipset. It comes with 64 GB storage with 4 GB RAM and 32 GB Storage with 3 GB RAM. The Honor 9lite does have a dual primary camera with 13MP + 2MP. The front-facing camera also features a dual camera with 13MP + 2MP. The device has a non-removable 3000mAh battery. 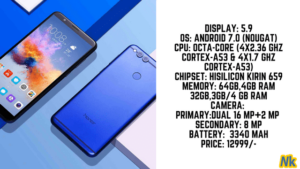 Honor 7X is similar to the Honor 9 lite. 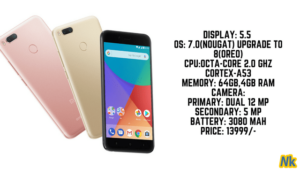 Most of the specifications are similar on both of these devices. 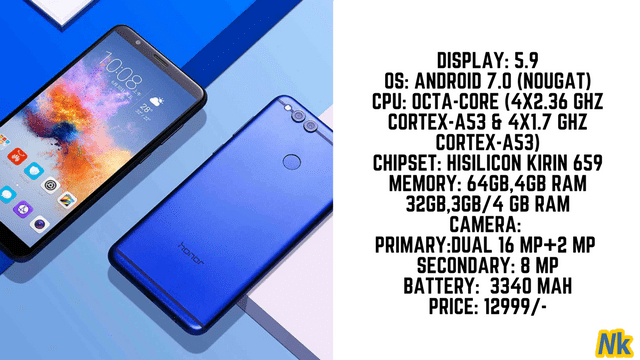 Honor 7X comes with 18:9 full HD display with 2.5D glass protection. Like Honor 9 lite, it has dual camera 16 MP + 2MP primary camera with portrait mode. And in the front, we get an 8MP camera. 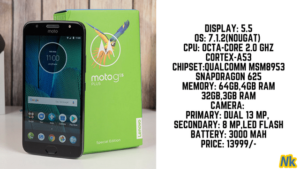 The device comes with Octa-core processor and 4 GB RAM which make the device run heavy games so smooth. It’s come with 3340 mAh battery which is non-removable. Related: Do this to keep your smartphone battery healthy! We have tossed our ideas on best smartphones under ₹ 15000. 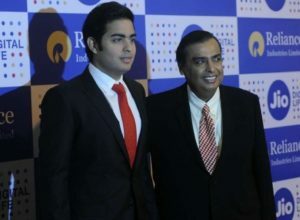 Now, it’s up to you to purchase any of these smartphones. 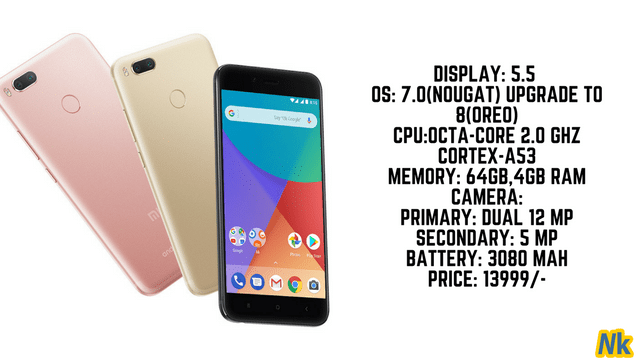 If you know any better smartphones at this price, let us know in the comments!